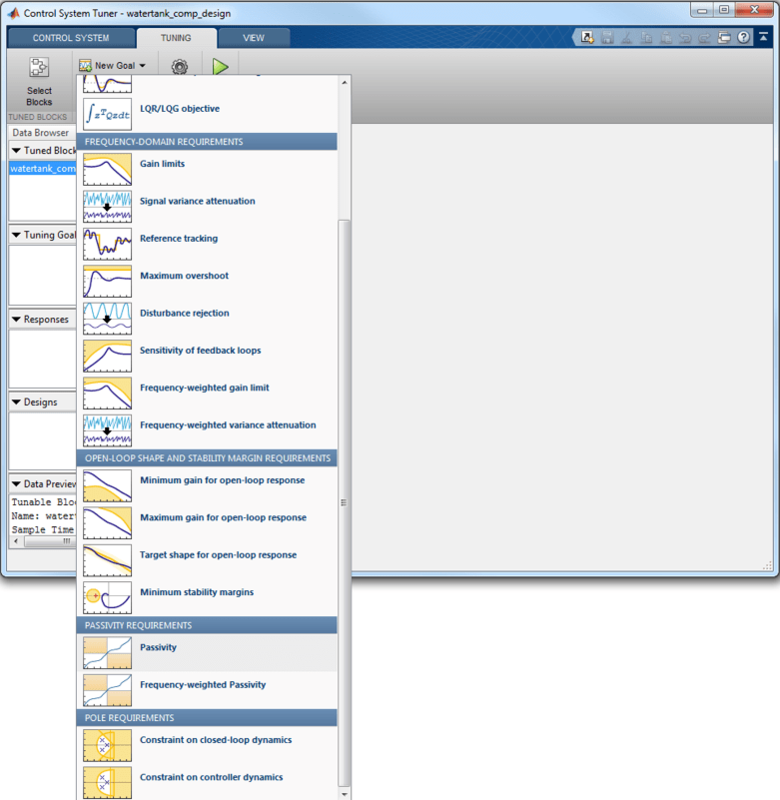 Simulate the closed-loop nonlinear response. The watertank_comp_design model, shown in the figure below, models a feedback loop for regulating the water level in a water tank. The Controller block contains the first-order compensator to be tuned. The Water Tank subsystem models the water-tank dynamics. Water enters the tank from the top at a rate proportional to the voltage, V, applied to the pump. The water leaves through an opening in the tank base at a rate that is proportional to the square root of the water height, H, in the tank. The presence of the square root in the water flow rate makes the plant nonlinear. By the Passivity Theorem, the negative-feedback interconnection of two strictly passive systems and is always stable. 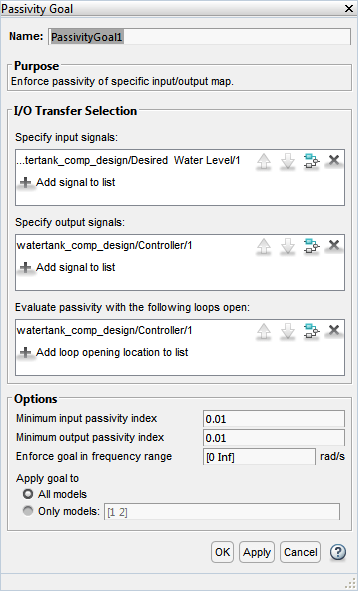 Since the water tank system is passive, it makes sense to require that the controller be strictly passive to guarantee closed-loop stability even when the plant model is inaccurate. You can use the Control System Tuner app to tune the Controller block. Step 3: Select the Controller block and Click OK. This block now appears in the Tuned Blocks list. Click on the New Goal dropdown list and first add a Passivity goal. Configure this goal to apply to the Controller block only. 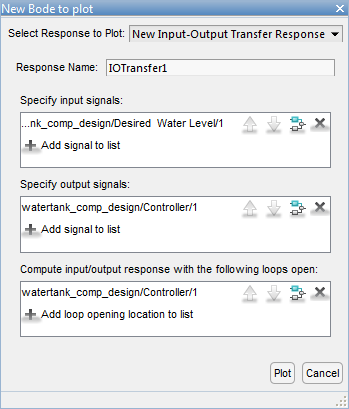 This is done by setting the input signal to be the "Desired Water Level", the output signal to be the output of the Controller block, and the loop opening to be at the Controller block output. Also specify minimum passivity indices of 0.01 at the inputs and outputs to enforce strict passivity. Next add a Reference Tracking goal from the New Goal dropdown list. 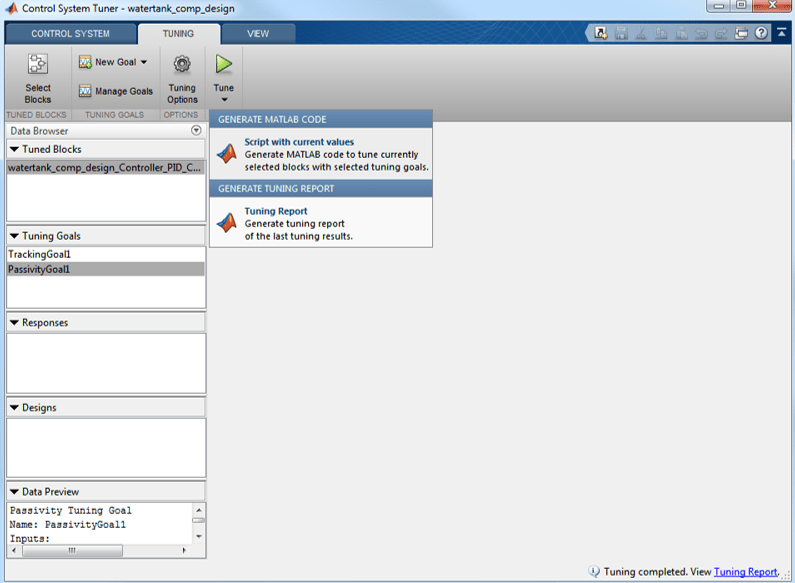 Configure this goal for a 1 second response time. 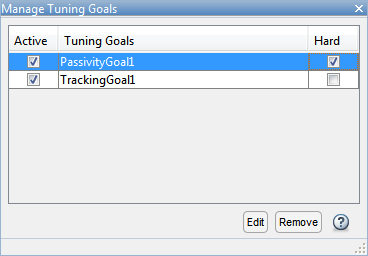 Finally, click on the Manage Goals button off the Tuning tab and mark the Passivity goal as a hard tuning constraint. Step 5: You are ready to tune the Controller block. Click the Tune button. You can view the tuning results side by side by selecting Left/Right in the View tab. 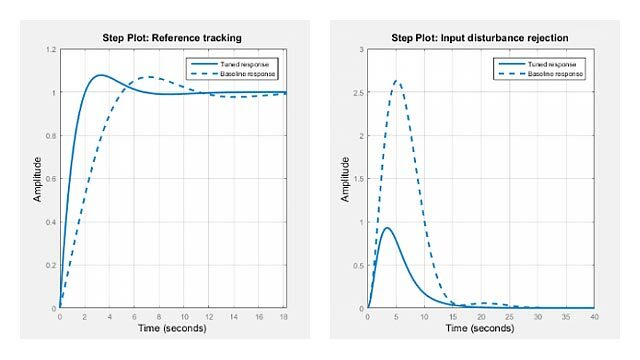 You can further analyze these results by generating a MATLAB script that reproduces this tuning process. 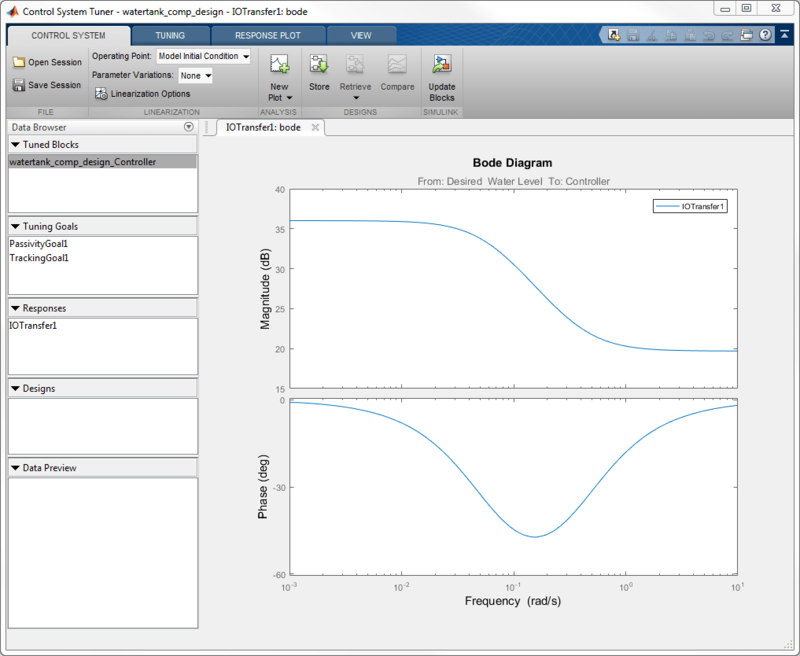 You can view the Bode plot of the tuned controller. 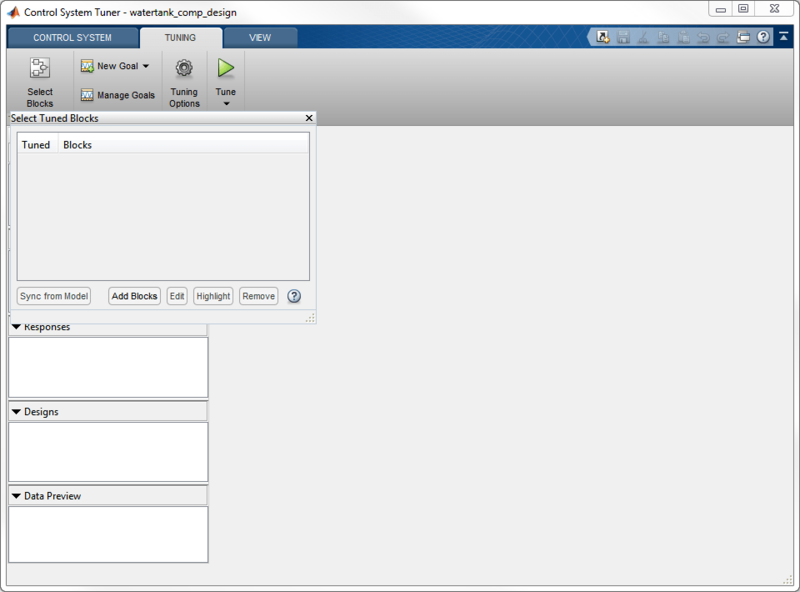 Click on the New Plot button off the Control System tab. Select New Bode from dropdown list. The controller response can be specified as follows. Click on the Plot button. The bode plot is shown in the following figure. 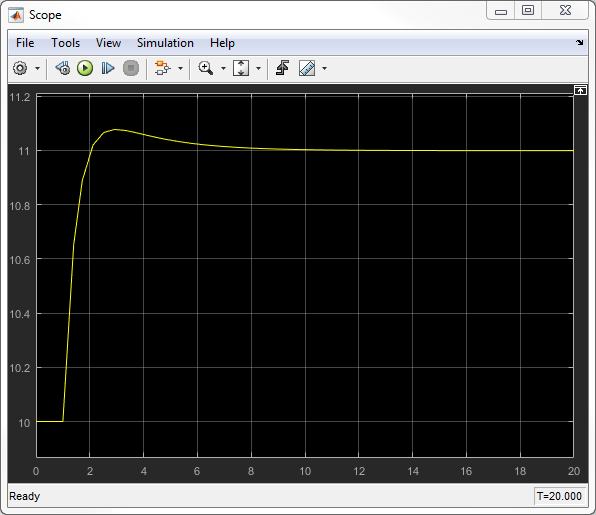 You can also simulate the closed-loop nonlinear response with the tuned controller. 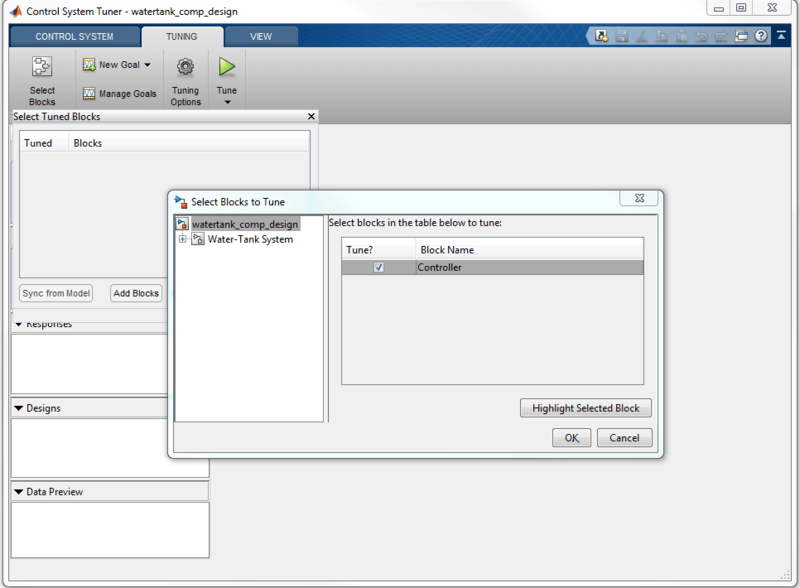 First, update the Controller block by clicking Update Blocks in the Control System tab. 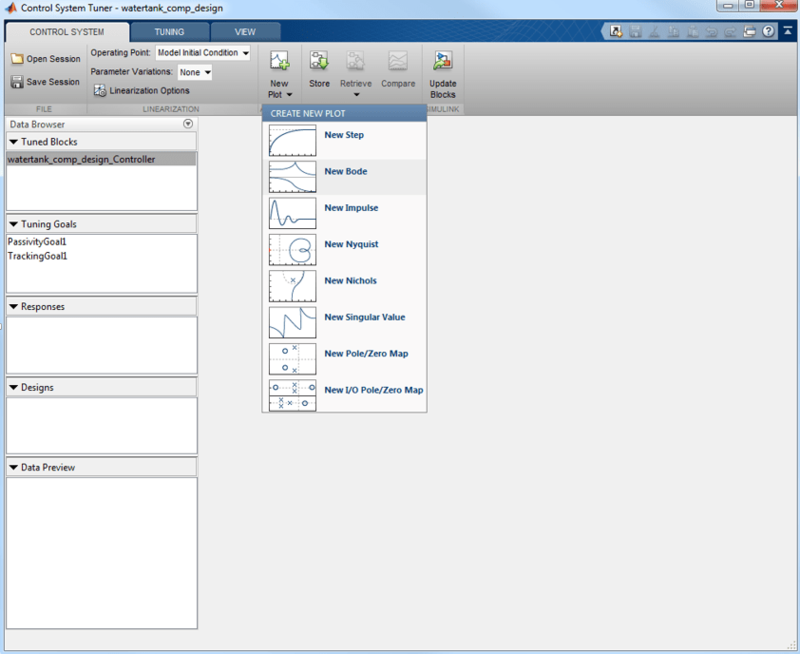 In the Simulink model, double click the Scope block to open the Scope window, then simulate the model. The nonlinear response of the tuned control system appears in the Scope window. 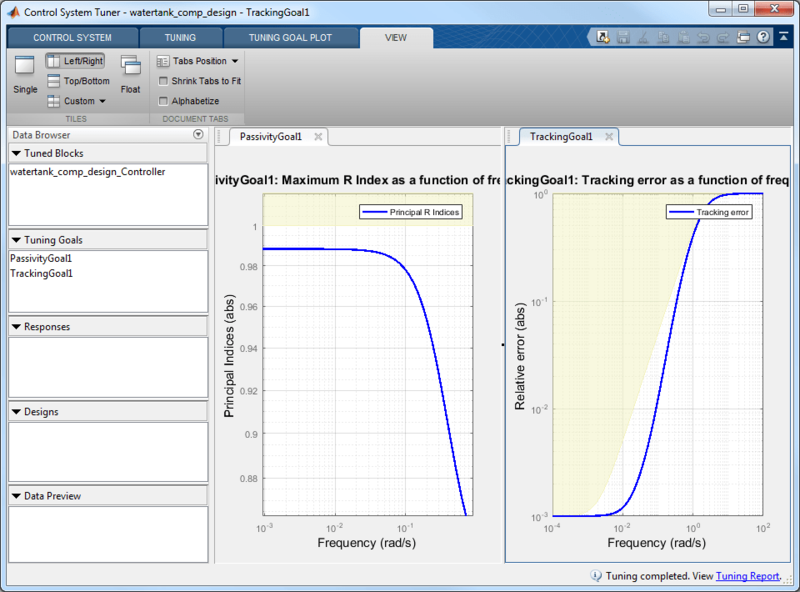 This simulation shows that the tracking performance is satisfactory.